Workman Publishing Company, 9780761166764, 688pp. "A compassionate guide of encyclopedic proportion." 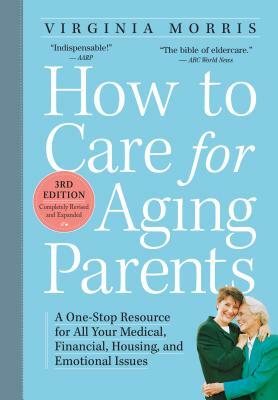 "This guide, aimed at the "Sandwich Generation," provides a road map to assist adult children in caring for their aging parents. Combining personal experience with expertise in healthcare and social and political issues, Morris has produced a thoroughly researched, well-organized, and comprehensive manual. Chapters follow in logical progression, yet they can stand alone and be read on an "as-needed" basis. The topics covered include the concrete, practical areas such as home care, finances, nursing homes/hospitals, legal issues, and medical/safety concerns as well as the psychosocial areas of handling emotions, dealing with death and dying, sibling conflicts, and spiritual needs. In her discussions, Morris adds useful details such as a suggested list of things to pack for the hospital. Support for the caregiver as well as to the elderly person is covered. Sprinkled throughout the text are agencies, phone numbers, and other reference information." "A must-read … [Morris] thoroughly addresses the subject, covering most topics imaginable from standards such as exercise and healthy diet to uncomfortable ones such as STDs, Alzheimer's, and delusions and hallucinations.… Her frank approach manages to be both compassionate and direct making the most awkward or devastating topics manageable."